Do you have a Facebook Messenger bot? 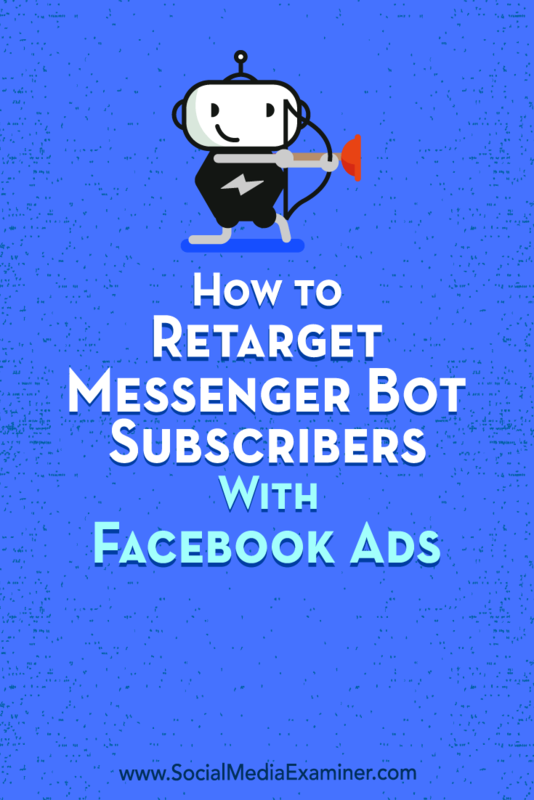 Have you thought about retargeting your bot subscribers with Facebook ads? 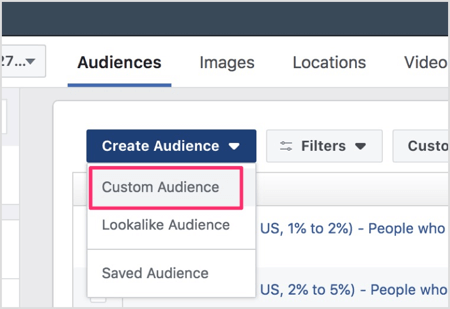 In this article, you’ll learn how to create custom and lookalike bot audiences for Facebook ad targeting. 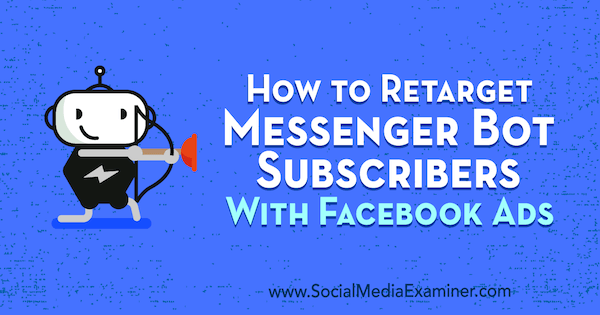 How to Retarget Messenger Bot Subscribers With Facebook Ads by Kelly Mirabella on Social Media Examiner. Why Retarget Messenger Bot Subscribers? There is no warmer audience than a Facebook Messenger bot audience. These users are typically highly engaged and super-familiar with your business and content, making them an ideal audience for marketing your paid products. When you target warmer audiences, you’ll find you convert at a higher rate and your ads cost less. If you use ManyChat to manage your Messenger bot, you can export your bot subscriber list from the platform and use it to create a Facebook custom audience. 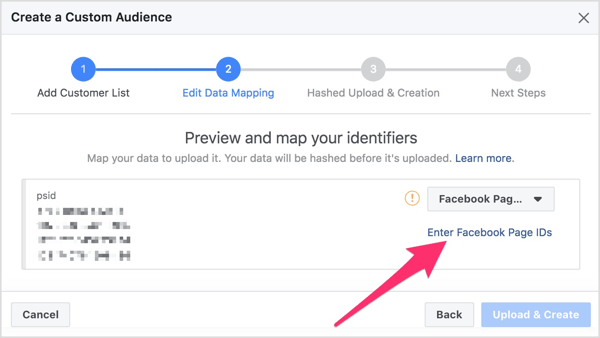 In addition to being a warm audience, it will have a 100% import rate because the data you’re exporting from ManyChat is their Facebook user ID number, which is tied to their Facebook profile. The only reason a Facebook user ID number would not be imported into your custom audience is if that person is no longer active on Facebook. In addition, you can create a lookalike audience based on your custom audience. While the custom audience is a near-replica of your subscribers, the lookalike audience is made up of people who are very similar to your subscribers. Targeting this lookalike audience can help you grow your subscriber base with like-minded users. 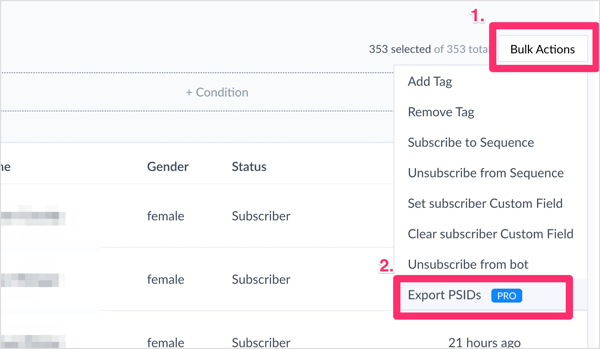 Now let’s look at how to export your bot subscriber data from ManyChat so you can create custom and lookalike audiences and show your ads to the right people at the right time. The first step is to export your Messenger bot subscriber data from ManyChat. To do this, log into ManyChat and navigate to your Audience tab in the left menu. You then see a list of all of your Messenger bot subscribers. 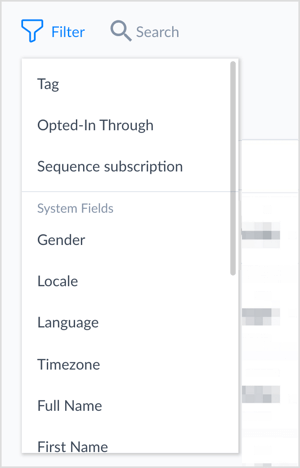 If you have a large subscriber list and want to segment it before exporting, click the Filter icon and then click + Condition. From here, you can select any number of tags, segmentation, and conditions you want. 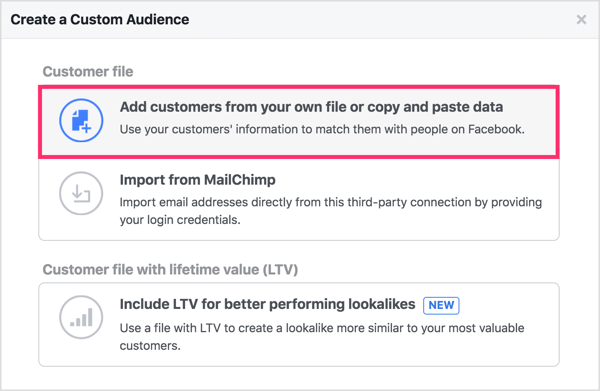 If you’re planning to create Facebook lookalike audiences based on this list, make sure your data set (a.k.a. user list) is large enough. The minimum data set is 100 users. This means 100 people have to be successfully imported to your list to create a lookalike audience. Keep in mind that the larger your data set, the better your list will be. Lookalike audiences will be more accurate if Facebook knows a lot about your audience. You’ll also likely see lower ad costs and higher conversions from your ads. Of course, you may choose to simply export your entire list of subscribers, which is fine too. Once you have the list you want to export, click Bulk Actions and select Export PSIDs from the drop-down menu. The data you’re exporting (PSIDs, or page-scoped IDs) are the ID numbers created when users interact with your Facebook page’s Messenger. To get access to the Export PSIDs feature, you’ll need to upgrade to a ManyChat Pro account. The Pro plan includes a lot of amazing tools and starts at only $10 per month for up to 500 subscribers. 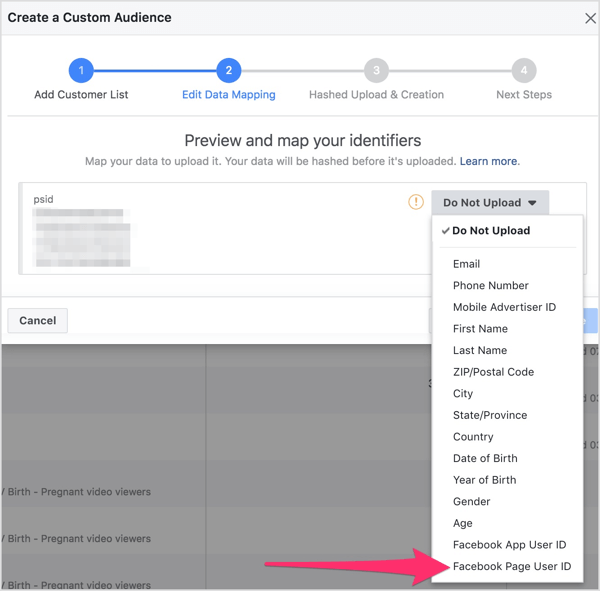 Once you have your list of Facebook user IDs in a CSV file, you’re ready to use it to create a custom audience. 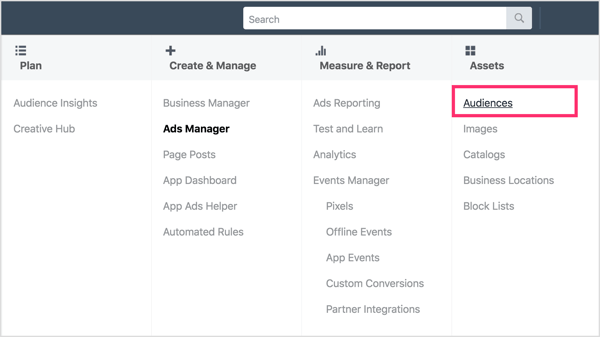 Open Facebook Ads Manager and select Audiences under Assets. When the Audiences dashboard opens, click Create Audience and then select Custom Audience from the drop-down menu. Because you want to use the CSV file you exported from ManyChat, select Customer File as the basis for the custom audience you’re creating. Then select Add Customers From Your Own File or Copy and Paste Data. Now you’ll prepare your file. Click Select the Origin of This Upload and choose the source of your data. In this case, it’s from a partner (ManyChat). Then click Upload Your File and navigate to your CSV file. When you’re done, click Next. 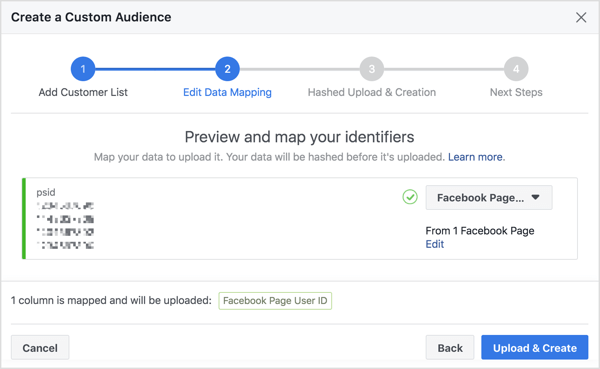 Facebook shows you a preview of the identifiers they’ll use to map your data. From the drop-down menu, select Facebook Page User ID. You may notice you’re still not able to move forward and upload your data just yet. This is because the data still isn’t mapped. To do this, click the Enter Facebook Page IDs link. In the pop-up box, enter the page ID number that corresponds with the Facebook page tied to ManyChat where you received this data. Mapping the data ensures that advertisers don’t improperly import data that doesn’t belong to them and upholds the privacy standards for Facebook users. In other words, Facebook doesn’t want you importing data from various business pages into one ad account. This step ensures that the data you’re importing belongs to the page the end user originally interacted with. To find your Page ID number, go to the About section of your page and scroll down to the bottom. You’ll see it noted there. Copy and paste it into the pop-up box and click Add. When you’re done, click Upload & Create to build your custom audience. 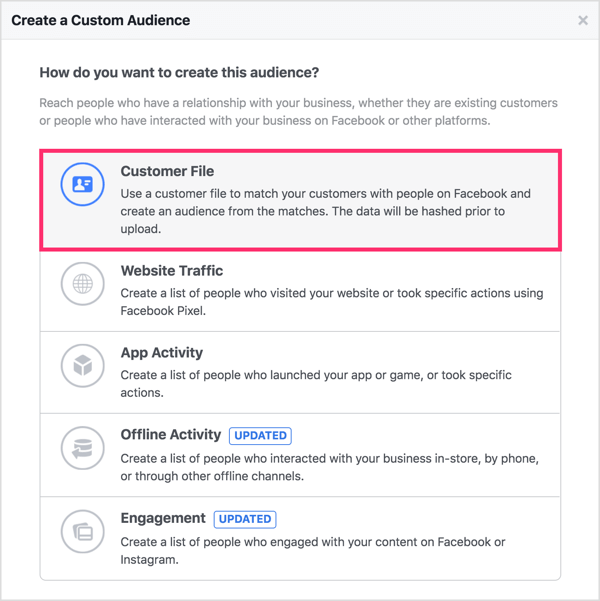 On the page that confirms your audience data was uploaded, you’ll see the option to create a lookalike audience, which can help you further grow your Messenger bot subscriber list. As mentioned before, your custom audience list must have at least 100 users to create a lookalike audience. Alternatively, you can create a lookalike audience from the Audiences dashboard. Click Create Audience and choose Lookalike Audience from the drop-down menu. 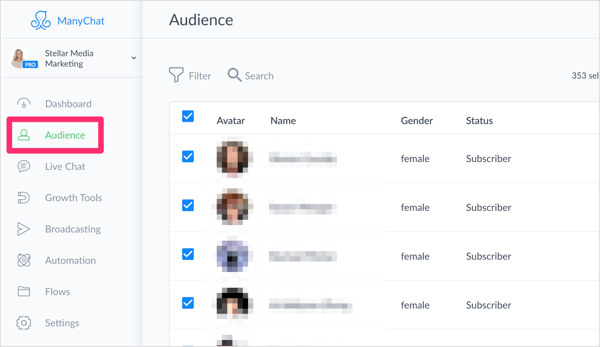 In the Create a Lookalike Audience window, select the custom audience you want to use to create your lookalike audience. Facebook automatically fills in the location where the largest portion of your ideal customer base will be located. Feel free to change this to target a different location. Next, drag the slider to select your audience size. An audience size of 1% is the most similar to your source audience, and as you move up to 10%, your audience becomes broader. 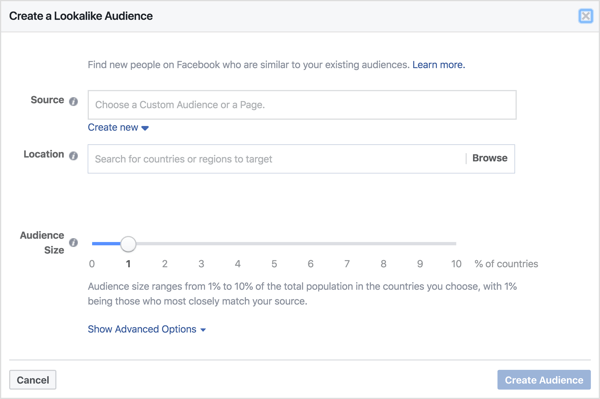 I recommend that you create several audiences based on your source audience list to give you multiple options to test in your Facebook ads. When you’re done choosing parameters for your lookalike audience, click Create Audience. 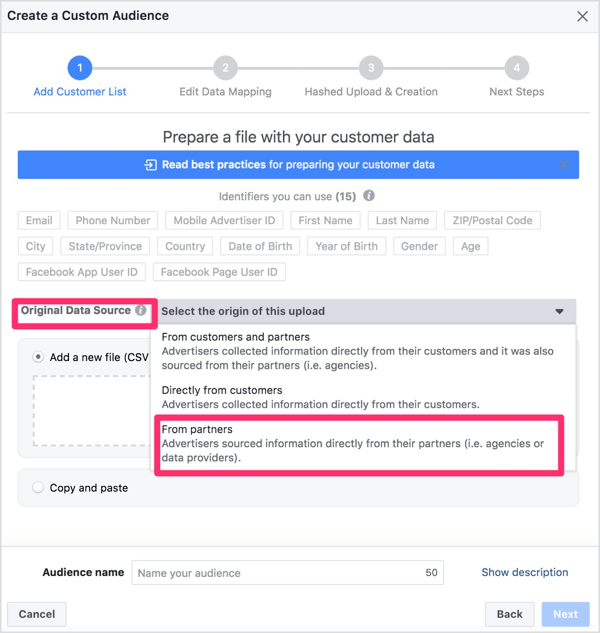 Once you’ve created your custom and lookalike audiences, set up your Facebook campaigns as you normally would and target the audiences you just created. Your custom audience is a very warm audience so it’s the best audience to sell to. Your lookalike audience is ideal for growing your subscriber base and warming users to you before pitching your products or services to them. Click here to learn how to build a Facebook Messenger bot sequence to automatically send valuable and relevant content to subscribers. What do you think? Have you tried exporting your Messenger bot subscriber data from ManyChat to create Facebook custom audiences? Did you segment the data before exporting it? Please share your thoughts in the comments below. Social media consultant and trainer and Facebook chatbot enthusiast. Passionate about helping people learn how to use social media for business. Learn more at stellar247.com.